First let's learn how to say hi. With an hola, a smile and a wave, you're on your way to making new friends. Watch the video introducing several conversational topics. Let's focus on the first half of the video - hi and how are you. Hi is, as you saw, Hola. There are three ways you can ask someone how he or she is. How's it going? (casual - to friends, family, kids) ¿Qué tal? How are you? (casual - to friends, family, kids) ¿Cómo estás? How are you? (polite - to adults) ¿Cómo está usted? There are several ways to answer. I'm doing great, thanks. Estoy muy bien, gracias. I'm doing fine, thanks. Estoy bien, gracias. I'm just ok. Estoy más o menos. / Estoy así así. / Estoy regular. I'm not doing well. Estoy mal. Listen to the kids say hi. Listen to the kids say hi around school. Felipe: Hola Marina, ¿qué tal? Marina: Bien gracias, Felipe. ¿Y tú? F: Bien, gracias. Bueno, hasta luego. José: Hola Sandra. ¿Qué tal? Sandra: Bien. ¿Qué tal, José? J: Bien, gracias. Hasta pronto. Felipe: Hi Marina, How's it going? Marina: Fine thanks, Felipe. And you? F: Fine thanks. Well, see you later. José: Hi Sandra. How's it going? Sandra: Fine. How's it going, José? J: Fine, thanks. See you soon. The boy uses the word tú for "you." There's another way to say you - usted - that you'll use to talk to adults in business situations. Listen to Maya and David say hi. D: Hola, Maya. ¿Cómo estás? D: Regular. Estoy cansado también. M: Lo siento. Bueno, hasta pronto. D: Hi, Maya. How are you? D: So-so. I'm tired too. M: I'm sorry. Well, see you soon. 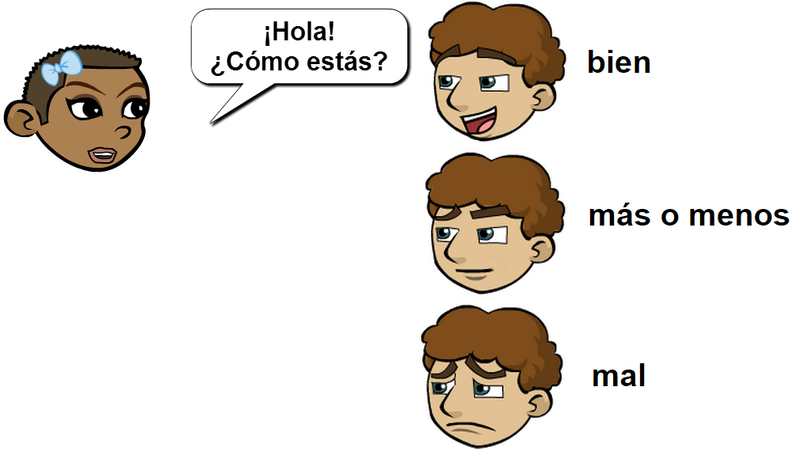 The polite, formal version is ¿Cómo está?, short for ¿Cómo está usted? Listen to Susana and Mr. Lincoln, her history teacher, say hi. sL: Hola, Susana, buenos días. S: Buenos días, señor Lincoln. ¿Cómo está usted? sL: Bien, gracias. ¿Cómo estás tú? S: Muy bien. Estoy lista para la clase de Historia. sL: Hi, Susana, good morning. S: Good morning, Mister Lincoln. ¿How are you? sL: Fine, thanks. ¿How are you? S: Great. I'm ready for History class. Did you see ¿Cómo estás tú? and ¿Cómo está usted? in their conversation? Mr. Lincoln was talking to his student, who's a lot younger than he is. So he used the informal, casual version of the question. He also called her tú. Susana used the polite version - she used está instead of estás, and used usted instead of tú. That's because she was talking to her teacher, not her friend. Strangers, teachers, and other professionals (and sometimes even older relatives) require usted. It's a sign of politeness. So make sure to use usted for 'you' with adults unless they invite you to call them tú. Talking to more than one adult? Use ustedes. Ustedes means "you all." If you're asking two or more adults how they are, you ask ¿cómo están ustedes? You'll learn more about this later. Culture Tip: In some countries, the culture is more formal. In others, lots of adults will invite you to call them tú! Watch the practice video to test yourself. Notice also that Susana calls her teacher señor Lincoln. For the most part, you use titles the same in Spanish and English. Listen as Mariana asks a stranger for directions. S: Sí, ¿te puedo ayudar en algo? M: Sí, ¿dónde está el museo de arte? M: Excuse me? Excuse me, sir? S: Yes, can I help you with something? M: Yes, where's the art museum? M: Oh?! Thanks a lot! 1. If you want to ask a stranger a question or for help, you can call him or her simply señor, señora or señorita. 2. If you don't know is a woman is married or not, señora is used for women over about 30, and señorita for young women and girls mid twenties and younger. So look around your classroom... it's filled with señores and señoritas. But... you still call them tú, not usted. Call your teacher usted. Say "good morning," or "good afternoon"
You can say "see you soon," "see you later," "see you next week," or just "bye." Listen as Isaac and Amalia say hi in the morning, afternoon and evening. Isaac: Hola, Amalia, buenos días. Amalia: Hola, Isaac. ¿Qué tal? I: Bien, gracias. ¿Y tú? A: Muy bien, gracias. Bueno, hasta la hora de almuerzo. A: Buenas tardes, Isaac. ¿Qué tal? I: Tengo hambre. ¿Y tú? A: Yo también. Bueno, voy a comprar comida. I: Yo también. Hasta luego. I: Hola Amalia, buenas noches. A: Buenas noches. Bueno, hasta mañana. Isaac: Hi, Amalia, good morning. Amalia: Hi, Isaac. How're you doing? A: Great, thanks. Well, see you at lunchtime. A: Good afternoon, Isaac. How're you doing? I: I'm hungry. And you? A: Me too. Well, I'm going to buy food. I: Me too. See you later. I: Hey Amalia, good evening. A: Good evening. Well, see you tomorrow. See the clip below for more ways to and info on saying hi. Play games to memorize the vocabulary.